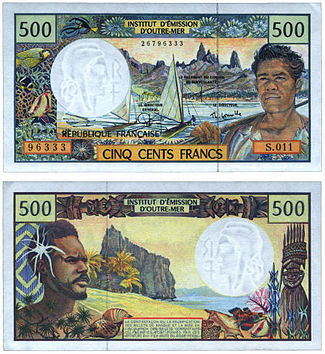 The CFP Franc is the official currency of the French overseas collectivities of French Polynesia, New Caledonia, Wallis and Futuna. Initially, CFP stood for Colonies Françaises du Pacifique or French Colonies of the Pacific. It was changed to Communauté Financière du Pacifique or Pacific Financial Community. Eventually, the term settled on Change Franc Pacifique or Pacific Franc Exchange. XPF is the ISO 4217 currency code is issued by the Institut d’émission d’Outre-Mer (IEOM) which is headquartered in Paris, France. It is not to be mistaken with the old currency used in france called the Franc. The CFP Franc was issued on December 1945 along with the CFA Franc which was the currency used in Africa. The Francs were created to offset the weakness of the French Franc which devalued after the Bretton Woods Agreement was ratified by France. The reason for the devaluation of the French Franc was to set a fixed exchange rate with the US Dollar. Thus, new currencies were introduced in the French colonies to protect them from the effects of devaluation. Since 1967, the CFP Franc had been issued by the IEOM. There were 3 distinct forms of the currency for French Polynesia, New Caledonia and the New Hebrides. Meanwhile, Wallis and Futuna stayed with the New Caledonian Franc. In 1982, the New Hebrides Franc was replaced by the Vanuatu Vatu. Fast-forward to present day and all banknotes from New Caledonia to French Polynesia are very much identical. The landscapes and historical landscapes of each territory are depicted on the opposite sides of the banknote.